Pastor David Rike joined Good Shepherd Lutheran Church of Fox Chapel on June 17, 2018. He is originally from Dayton, Ohio and graduated from Bowling Green State University in 1997 with a Bachelor of Music degree. He earned his Master of Divinity from Lutheran Theological Seminary at Philadelphia in 2001 and was ordained in 2002. 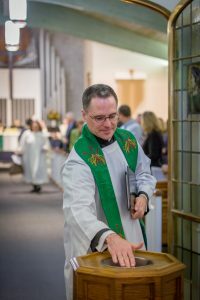 Pastor Rike previously served Jerusalem Evangelical Lutheran Church in Rothsville, Pennsylvania; Trinity Evangelical Lutheran Church in Wrightsville, Pennsylvania; and Trinity Evangelical Lutheran Church in New Smyrna Beach, Florida. Pastor Rike resides in the Fox Chapel area with his wife, Tonya, and their daughters, Cecilia and Sophia. Read the Oct. 10, 2018 article in the Trib about Pastor Rike. Pam has been a teacher at Good Shepherd Preschool since 2014. Teaching is Pam’s second career – in the 1990s she worked as an actuarial and financial analyst, with bachelor and masters degrees from Penn State and Villanova. In 1998 she completed her BS in education at IUP. Pam is also a black belt instructor at Young Brothers Tae Kwon Do. She and her husband have two sons in the Fox Chapel School District. Sandra Shoucair is a Fox Chapel Area High School graduate. She went to school at Boston University where she met her husband Jim. Sandra lived in New York City and worked downtown while her husband, Jim, attended law school. Jim practiced law for 17 years in New York City and then Pittsburgh, and then became an Episcopal priest. Sandra and Jim raised four children in the Fox Chapel school district: Emma, Olivia, Madeleine, and Peter. Sandra and Jim live in O’Hara with kids coming and going and two dogs, Jacko and Dougal.